The Cincinnati Bengals defeated the Chicago Bears on Thursday night, 30-27 opening the first full week of preseason action in the NFL. Ryan Nall was one of the biggest difference makers for the Bears’ offense. He converted three first downs, including a 69-yard scamper down the right sideline late in the third quarter. Quarterback Tyler Bray didn’t attempt too many difficult throws, as he was content dumping the ball underneath the coverage for most of the game. However, he showed tremendous accuracy early in the fourth quarter when he connected with TE Daniel Brown on a seam route in between multiple defenders. This was a rough outing for the Chicago secondary. Multiple defenders overran balls they were in position to contest, and their inability to tackle in the open field led to a number of big gains, including Joe Mixon‘s touchdown reception in the first quarter. Up front, the Bears were generally able to dictate play. The line frequently stuffed the line of scrimmage and beat blockers on run plays, and the undersized edge rushers proved too quick and athletic for Cincinnati’s tackles on passing downs. The offensive line had issues throughout the game. Virtually every tackle was unable to sufficiently close off the edge, and 2018 first-round pick Billy Price whiffed on a number of run blocks. Mixon’s opportunities were limited, but he made the most of them. He looked decisive and explosive when cutting on run plays (despite limited yardage), and heturned a short pass into a score by making two defenders miss in the open field. On defense, the Bengals had several breakdowns in coverage. The Bears made a handful of wide-open catches without a defender in sight. However, DT Geno Atkins was dominant in his limited snaps. He bullied Bears LG Eric Kush for a sack on the fifth offensive play of the game. On the ensuing play, he forced an offensive hold by C Cody Whitehair to kill the Bears’ drive. Chicago: With the Bengals suffering many lapses in coverage, the Bears’ receivers constantly found open holes for completions. However, Bray struggled to capitilize on his shots toward the end zone. An interception killed a promising drive early in the third quarter and later in the frame, he missed back-to-back throws on corner routes in the end zone. Cincinnati: The Bengals’ receiving corps took advantage of the excessive aggressiveness and poor size of Chicago’s cornerbacks all game. 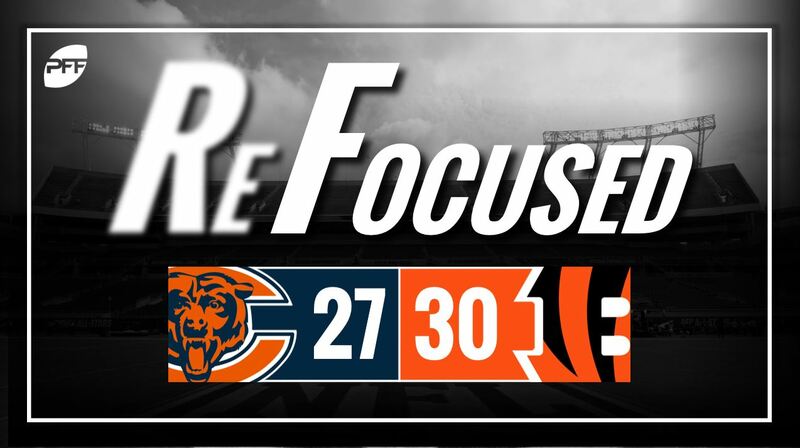 Bengals receivers turned a number of passes that could have been contested by Bears defenders in position to play the ball into huge gains, including the game-winning 33-yard touchdown grab by Auden Tate late in the fourth quarter off a scramble play.